If you or a trained professional have assessed the roofing or your Peoria, Arizona home and come to the conclusion that your roof needs to be repaired or replaced, then you might be wondering just how it’s done. If your entire roof needs to be replaced with newer, cleaner looking shingles, or if you are switching from shingles to tiles and vice versa, your curiosity might be gnawing at you to figure out how it’s done. The process of re-roofing is lengthy. Getting your roofing up to code and repairing the necessary damage that has been done to your roof can take time, but for trained professionals, it is as easy as breathing. The first thing that must be done is an inspection of your roof. This will ensure that your roof does indeed need to be replaced and that you are not spending unwanted expenses on replacing a perfectly good roof. You will want honest professionals who know what to look for when determining whether or not your roof does need to be replaced. Nail pops, loose shingles and cracked shingles are all factors that will be taken into account when the inspection is done. Sometimes the damage can even go a lot further than just the damaged outer layer of shingles and roof tiles. From there, the workers will assess the damage that has been done to the sheating underneath. Typically, there is a moisture and weather protection layer between the sheating and the shingles, but this is not always the case, especially in Peoria. Without the moisture layer, the sheating can sustain damage like dry rot, mold, and other harmful deterioration. Once the damage is determined, the replacement for this layer can be done and the repairs can continue on the rest of the roof. Then, the damage in your attic is assessed to see what repairs need to be made inside, like the sheetrock of your ceiling and the insulation protecting you from the elements outside. Sometimes the damage can be more extensive here than the actual roof. With the right professionals, however, the repairs can be done quickly and you can be on your way to having the brand new roof you’ve been needing. Once all of the repairs have been made, a project manager inspects what has been done and determines if the team is ready to move forward with the replacing of the roof. He makes suggestions on what to adjust and makes sure no corners have been cut to ensure that you have a roof that lasts you for years to come. Once he gives the go ahead, the team can move forward and begin installing your brand new roof. Next, modifications begin. This involves new ventilation, locations of new skylights, gutters, ridge venting, and any other new accessories that will update the look of your roof. This is done before the new deck protection is applied to further the life of your roof and keep it as long lasting as possible. Once the deck protection is applied, the roofing process can begin and if you are either replacing your shingles with roof tiles or vice versa, it will be important for both to be installed per the manufacturer’s specifications. This will give your roof a long life that will provide protection and stability for the structure of your home. 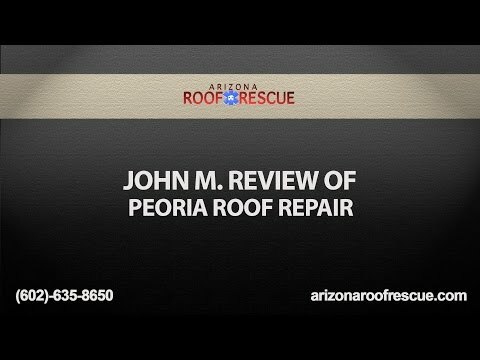 For the best Peoria Roofing services, come to Arizona Roof Rescue. We have the tools and knowledge necessary to provide you with the highest quality roofing services. Whether your roof needs to be repaired or replaced, we are an honest, hardworking, and cost effective way to replace your roof on a budget. We will give your roof new life and make sure it is up to code and can protect you and your family for as long as possible. For more information about our excellent quality services, give us a call at (602)-242-2706.